Many times we say that shape and function should go side by side. Sometimes it is just an expression used for a marketing stratagem but other times it becomes reality as we see for some products in our sector. Putting together aesthetics and function is something very difficult, something that not everyone can achieve. The loudspeakers that we have here for a review are the "Da Vinci" model that I would have called "Colombo", to paraphrase the expression that we use for things that are self evident, "Egg of Columbus". The reason is simple: first of all their shape is oval and then Lorenzo Martinelli, the designer, did something unconventional but effective as we will see shortly. 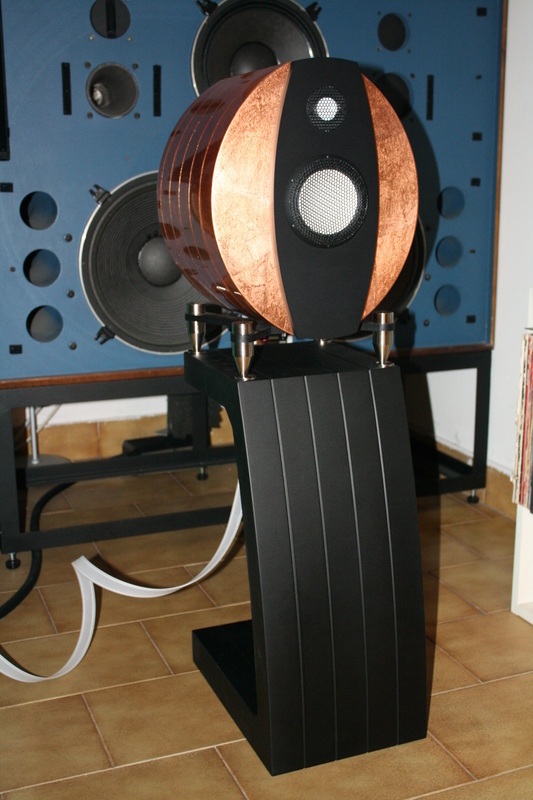 We will not introduce again EMMESpeakers, since we already did it in the previous review of their "Beta" model. We met these Da Vinci loudspeakers last year at the Munich High End Show presented as a world first preview. What we had seen until Munich was just a rendering because the prototype was not ready. To be honest, at first its aesthetic was so peculiar that it almost impressed us negatively. In Munich we had a better impression but not totally positive yet. Few months ago we received an invitation for the Italian launch in a shop in Brescia and we finally listened to their sound. Now that we are getting used to their look we kind of like it but we like their sound above all. 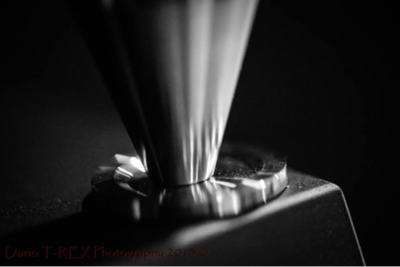 We were so impressed by these gears that we asked them for a review. We are the first one, in Italy, to review these Da Vincis and we are going to talk about them thoroughly. The project DA VINCI has represented a new challenger for our Company, with the ambition to create an innovative acoustic scheme enclosed in a revolutionary shape, guided by our usual and brazen determination to explore new technical routes matched with “breaking” concepts of design. 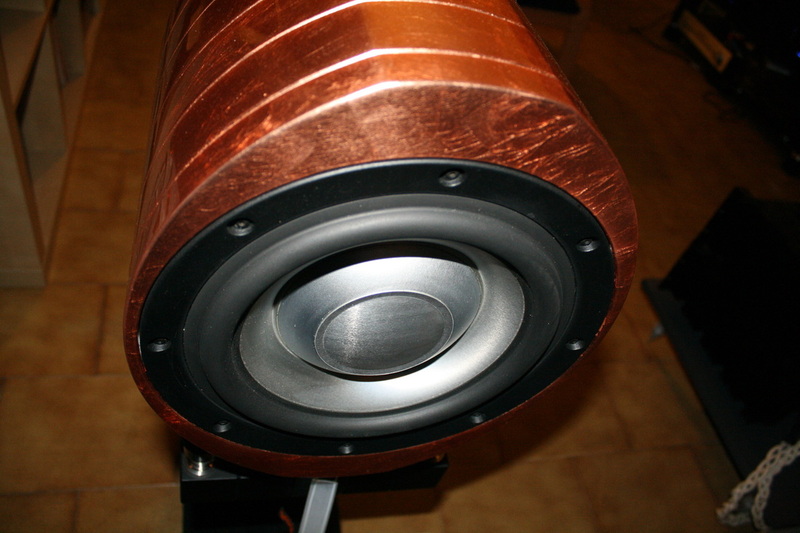 Those base requirements brought us soon to design a new concept of three-ways layout, in which the Woofer has been positioned on the rear baffle. Shift the traditional vertical development to one in depth (req #1). Keep the acoustic center in a restrained vertical area, all over the frequency range (req #5). As it's visible in the picture below, the acoustic center moves only of 120 millimeters, between the Midwoofer and Tweeter, just like an Two-ways system but the DA VINCI is a Three-ways. 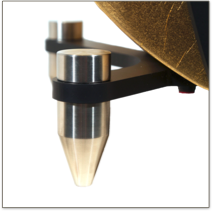 That means at the listening distance of 2.5 meters, the acoustic centre moves less than 3° degrees, very close to a point source, with evident advantages in terms of soundstage wideness, stability and focalization. 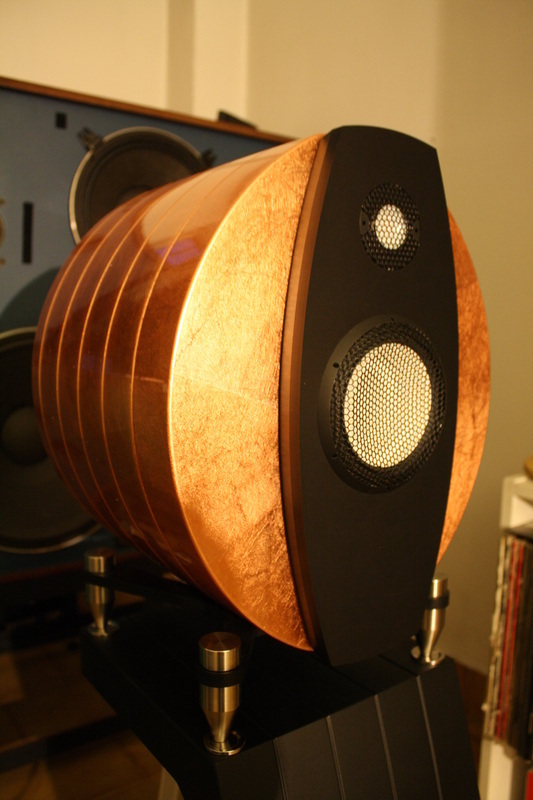 An incredible result for an Three-ways loudspeaker. The restricting project requirements, and the unusual woofer positioning, put us in a long phase of searching and testing of proper drivers. The choosing has fallen on 1,2” Tweeter and 5” Midwoofer by Accuton, the newest CELL ceramic series, thanks to their outstanding sound performance (wide bandwidth, extremely low distortions, low loading volume required by the Midwoofer) (req #5), and the 10” Aluminum Woofer by SB Acoutics, thanks its shallow depth and, even in this case, low loading volume requirement. and high power handling (req #2,3,5). 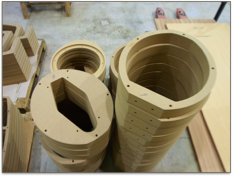 Faithful to our traditional method in cabinet construction, by machine made MDF layers, che choice has fallen soon in a shape as closer as a tube, the more rigid solid available. It guarantees sturdiness, no internal resonances and of the cabinet itself. The front baffle, in black anodized aluminum with 25mm of thickness, receives from Beta and Gamma EMMESpeakers’ loudspeakers the BSSE System, in which its shape and dimensions are designed to “synchronize” the edge diffractions with the direct emission. To meet the req#1, the loudspeaker sizes has been limited as much as possible, so the binding posts have found place on the bottom of the cabinet. An asymmetric structure of anodized aluminum and stainless steel AISI 304 supports the speaker. Thanks to the calibrated thicknesses and shapes, it has a programmed compliance with self-leveling function and vibrations damping. The DA VINCI, as said, has a three-ways layout. 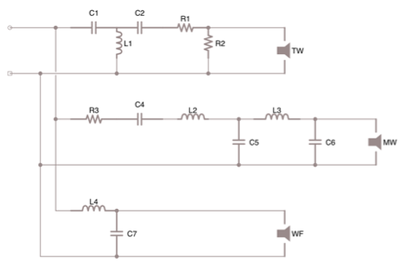 As usual for EMMESpeakers, it crosses over at very low frequencies with high orders of slope. 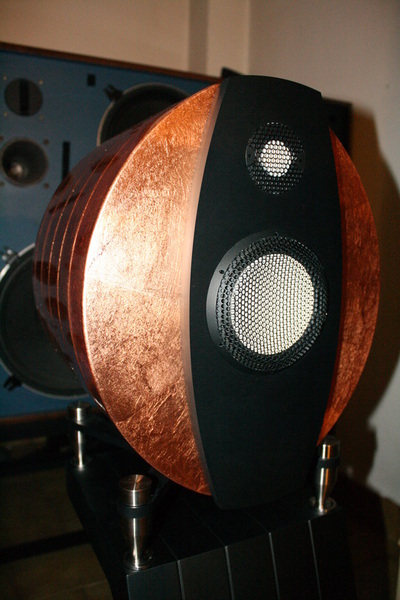 That to obtain very constant radiant lobes and the highest detail in sound reproduction. Taking a look at the network drawing it appears quite complex. Actually the BSSE system intervenes in the drivers' radiations, preparing them to the crossovers and making the network simpler than it should be without the BSSE system itself. 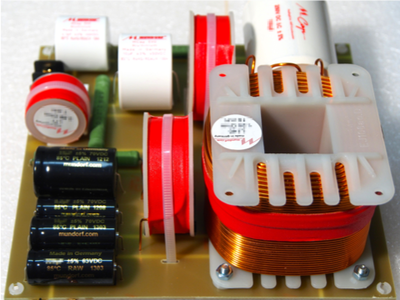 The production of the crossover boards are made by Mundorf using exclusively Mundorf components, according to strict quality controls. 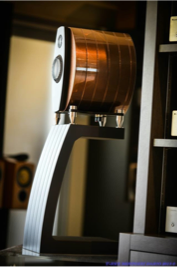 A loudspeaker with a such innovative design like the DA VINCI, has required the study of a dedicated stand able to join good-looking and function. Once again the EMMESpeakers method of manufacturing, by MDF layers, has represented the best solution, leaving us the wider freedom in shaping and design. The final result is a solid and versatile dedicated stand, with a simple but beautiful design. Four disks of stainless steel AISI 204 offer the support points for the DA VINCI spikes, guaranteeing stability and vibrations damping. With a base finish in black matte and textured paint, but ever available in all EMMESpeakers finishes, it offers an easy installing in any domestic context. 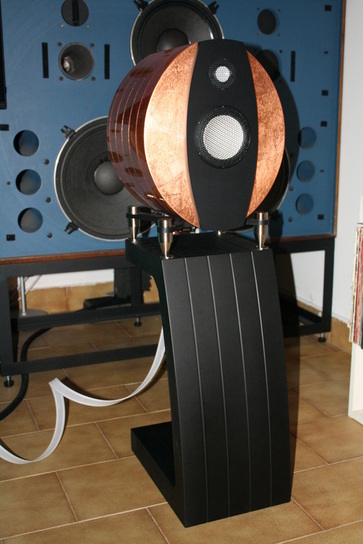 The Da Vinci have been connected to the following system: turntable Basis 2001, tonearm Graham 2.2, cartridge Lyra Kleos, phono preamplifier:Einstein "The Turntable's Choice", CD/SACD player dCS Puccini + Puccini U-Clock, preamplifier: MBL 4006, power amplifiers: Bryston 7B ST mono, loudspeakers: JBL 4350B, interconnect cables: MIT Oracle MA-X Proline, MIT Shotgun S2 RCA, Transparent Super XLR, Transparent Super RCA, LAT International XLR, loudspeaker cables: MIT Magnum MA, Vovox Initio, USB cable: MIT SL-Matrix USB, power cables: MIT Shotgun AC 1, Black Noise Pearl and others DIY, mains distributor: Lector Edison 230/8, mains filter: Black Noise 2500. The first record we listen to is Dvorak’s 7th Symphony performed by the Cleveland Orchestra directed by George Szell on SACD (not hybrid). The orchestra seems very big despite the small dimensions of the loudspeakers that suddenly disappear and become transparent, they seem to emit no sound as if they were spherical. 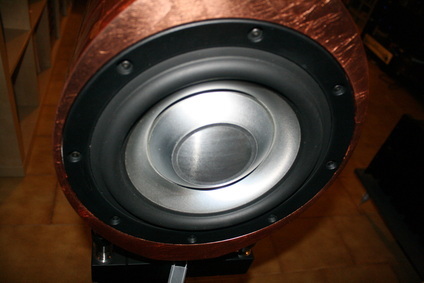 The interaction with the rear woofer is perfect, the mid-low range does not show signs of that saddle that the producers of small loudspeakers often use to give a hint of bass to a loudspeaker that otherwise would be empty in the low frequencies. The 10” aluminium cone woofer positioned in the rear panel is incredibly effective. The 1965 vinyl “Krupa and Rich” (Verve Records) is a mono recording in which two of the greatest drummers in history face each other. With this record the Da Vincis show their medium range that is correct with Dizzy Gillespie’s trumpet and also with Illinois Jaquet’s tenor sax. All in all it is an enjoyable listening even if the recording in itself is not great. The sound of the snare drum is beautiful; the ceramic used for the midrange cone seems to be really fit for the percussions that insist on the medium and medium low-range. Another confirm of something I had noticed when I owned the Avalon Opus Ceramic. 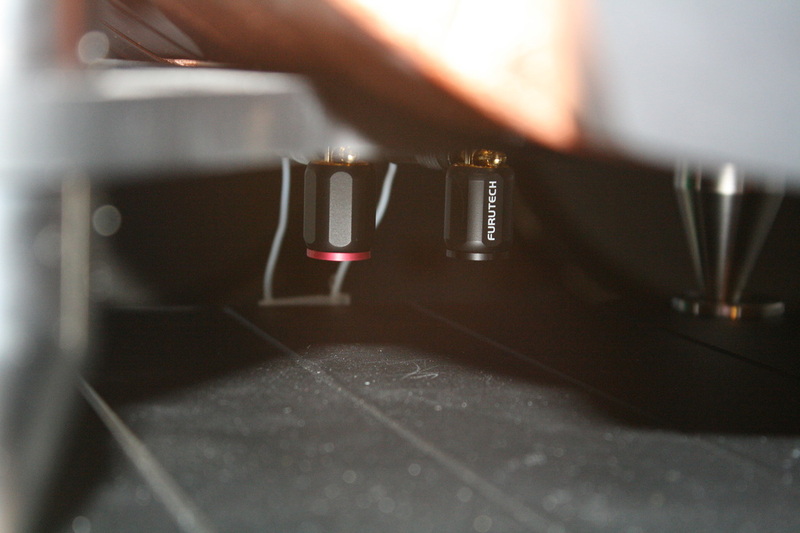 While I am reviewing these loudspeakers I am burning in my new Lyra Kleos cartridge. With the Da Vincis I noticed immediately and clearly a difference in the sound when I got to listening to the third or fourth record. Another validation of the fact that that they have a very good resolution and a great sensitivity to the source, that is not altered by the loudspeakers themselves. 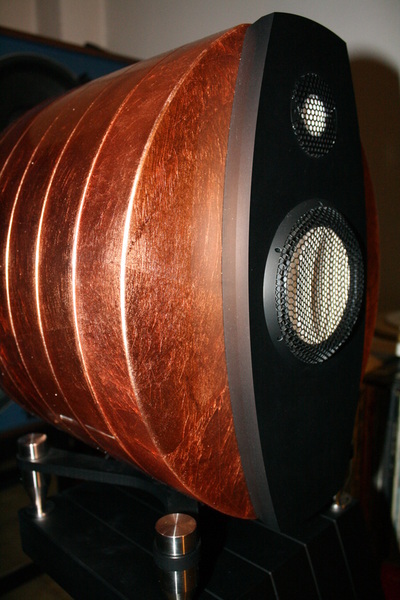 The sense of rhythm is good too, these loudspeakers are not boring and interact with music. They are vigorous and enthusiastics and pass on these feelings to the listeners. “Tribute” is a double LP by the Trio Jarrett, Peacock and De Johnette (ECM). 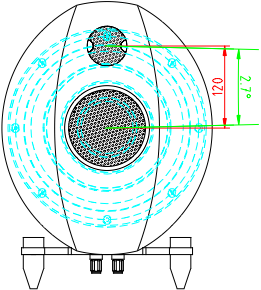 The frequency response is extended and I notice that the tweeters reproduce clearly the sound of the sticks on the on the cymbals of the drum and on their stands. DeJohnette is among the few drummers that not only give the rhythm to the band and thanks to his technique and fantasy is also able to play real music. I like to compare him to Steve Gadd even if they are very different in playing an instrument that can be multifaceted. I turn up the volume and the bass drum comes out with strength but also well muffled. The piano has the footprint typical of Jarrett/ECM, a balanced sound with a lot of echo. Very coherent, close to perfection is Peacock’s doublebass. I stare at those ceramic midranges astonished. From those small loudspeakers a lot of good music is coming out and I start thinking how can they possibly do it; they are so small! I consider that if I should buy something to play music in my livingroom, these Da Vincis would be my first choice. The sound is complete, transparent and rich of those details that make of a sound reproduction a classy sound reproduction. The dynamics of the solo passages of the drum impress me positively. Now I am undecided whether to listen to Janacek’s Sinfonietta conducted by Serebrier on a vinyl record Reference Recording or to listen to Karel Ancerl and the Czech Philarmonic Orchestra (Supraphon) on vinyl too. I choose the second title that is not recorded as well as the Reference Recording but it is a performance that moves me (I want to point out another very good Sinfonietta performance and recording of the London Symphony Orchestra directed by Abbado for Decca). The orchestra has the right dimension considering the speakers we are using. The brass instruments, that are maybe a bit too metallic than the average in this recording, do not annoy and the whole orchestra breathes and lives in this beautiful performance with all the noises in the background of the musicians that are moving on the stage. This is much better than those aseptic recording that thanks to all the editing cuts are flawless and unnaturally perfect. I am mesmerized by this beauty and I listen to the other side of the record: Taras Bulba, that convinces me straight away with a reproduction of an organ pedal at a very low frequency. The sound is deep but does not have that distortion that comes out when they are pushed to the limit. The ability of these DaVincis to disappear and to recreate a realistic soundstage is something that is not commonly found in the devices of the competition. I listen to “Trilogy” by Emerson Lake and Palmer (Earmark reprint) and I notice that these loudspeakers are swift and their small ceramic cones react straight away to the electric signal. The plectrum on the strings of the acoustic guitar has a sound very close to reality. What else can I say to conclude? We have here two real queen-bees, two divinas that, to express themselves at best, need labour and dedication. Few words about the correct positioning that is really really important. Few degrees in the listening angle can make the difference. The distance from the walls and from the listening point are important as well. I usually love best the loudspeakers in parallel position from the back wall but this time I turned them towards my ears to have a more linear response of the medium high range and with an influence also on the lower range. Every room is different so my instructions will not be correct for all those that will listen to these Da Vincis loudspeakers in their house. And I am sure that there will be many listeners! 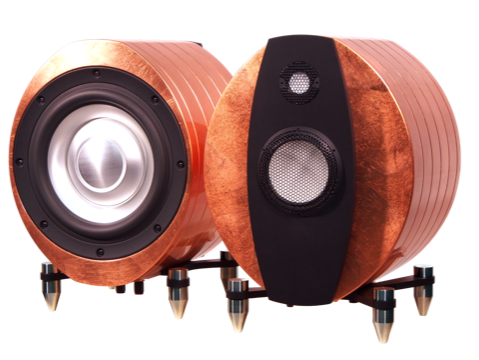 If you have an EMMESpeakers retailer close to you go there and have a listen. Then let me know what you think. As for me I can say that it was a long time since I last had such a nice impression of a component, a component that is not extremely expensive. What we have here is something that is not cheap but the sound is worth every cent. Their look and wonderful finishing are for free!